Georgia Capitol Museum is a public educational institution housed in the State Capitol building. 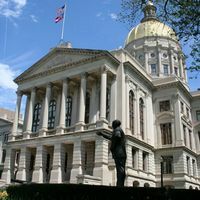 The Museum seeks to preserve and interpret the history of the Georgia State Capitol building itself, as well as the events that have taken place within its walls. To carry out this purpose, the Museum collects, maintains and exhibits significant artifacts including historic flags and works of art within the State Capitol. Public tours are conducted daily. Parking: Paid parking is available in a lot located across the street from the Capitol at 130 Capitol Ave. (open to the public May through December) and at 65 Martin Luther King Jr. Dr. (open to the public year-round). Metered street parking is also available on city streets. MARTA: Take the Blue or Green Line to the Georgia State station. Head southeast out of the station, and turn right on Jesse Hill Jr. Dr. Turn right on Martin Luther King Jr. Dr. and left on State Capitol to arrive at the museum.